Homologous recombination using a targeting construct designed for gene replacement in a positivenegative selection strategy. In this example, a deletion is made by excising an XbaI (X) gene fragment corresponding to a protein-coding portion of an exon. 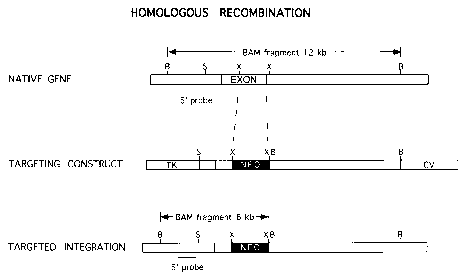 It is replaced in the targeting construct by a neomycin resistance cassette (Neo), and an exogenous BamHI (B) restriction site is introduced in the process. In a targeted integration event, construct sequences replace the corresponding region of the native gene. The Neo cassette, a nonhomologous sequence, is included in the integration because it is flanked on both sides by regions of homology. 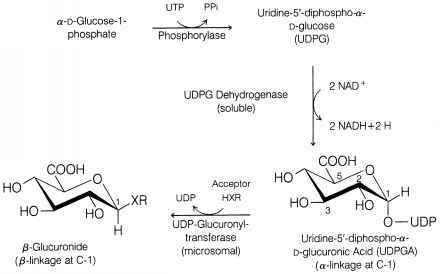 In contrast, the thymidine kinase cassette (TK) and cloning vector (CV) are excluded because they are not flanked on both ends by homologous sequences. Southern blot screening for homologous recombination may be achieved using a probe corresponding to a 5' flanking region of the integration site. Following BamHI digestion of genomic DNA, the wild-type allele will be indicated by a 12-kb fragment and the mutant allele by a 6-kb fragment. gancyclovir will kill cells that express this gene. The importance of this effect is described below (Section II.C). For reasons that are poorly understood, targeting efficiencies vary widely. Although much of this variability results from unknown factors, two contributing factors have been identified: length of homology and genetic background. A positive correlation is believed to exist between targeting efficiency and the length of homology between targeting vector sequences and those of the native gene.2829 Conversely, targeting efficiency does not appear to be markedly sensitive to the length of gene fragments that are deleted in targeting constructs. Another factor to consider in optimizing targeting efficiency is the use of a genomic fragment that is isogenic (derived from the same strain) with the ES cell line to be used. It has been suggested that strain polymorphisms, which are most prevalent in intronic regions (gene sequences not found in mRNA), may negatively impact targeting efficiency. In several cases the use of isogenic constructs has been shown to enhance efficiency relative to nonisogenic constructs for the same gene.30 Most ES cell lines in common use are derived from genomic fragments obtained from strain 129 libraries. Due to the marked genetic variability among 129 substrains, the optimal situation would be for both the targeting construct and ES cell line to be derived from the same substrain. However, it should be noted that many gene targeting attempts have been successfully achieved with nonisogenic DNA constructs.